All That Jas Live Catch Up! Hey All That Jas Live listeners! Jackie and I are so excited to hit with you another great blog update! On this post we want to recap all the juicy gossip and fun things talked about on September 22nd and 29th show! We want to thank our loyal and dedicated listeners for baring with us during our September 22nd show while we experienced a few technical difficulties! Though our show was cut short, we appreciate you for tuning in despite! Below you will find a track listing of all the hot music played on each show! On September 22nd’s show we discussed everything from rumours circulating about pop sensation Ariana Grande’s diva attitude! We also discussed whether or not we thought her infamous hair was real or fake, and whether or not it was hiding some sort of rare hair disease! Let us know what you think of this theory, or if you have some input you would like to share by tweeting us! @AllThatJasLive and we will be happy to give you a shoutout and a follow back live on next weeks show! Jackie and I discussed everything from Paris fashion week!– And of course all the drama that comes with it. This always includes the Kardashians… right? Kim K’s famous younger sister Kendall can officially be considered a world class model, walking in shows such as Balmain, Dolce & Gabanna and Chanel… just to name a few. However, while this is great for the already famous 18 year old… a lot of up and coming models are lead to believe Kendall, who is relatively new to the fashion world, is only booking major gigs due to her much more famous older sisters Kim, Kourtney and Khloe Kardashian. Kendall has said she wants to distance herself as much as possible from her older sisters in order to make a name for herself during go-sees and fashion shows. What do YOU guys think? We think regardless of her last name and fame, long legs and a beautiful face like Kendall’s doesn’t come around all the time! She may actually deserve her place on the runway, and I won’t be surprised if we see little miss Jenner strutting herself down the Victorias Secret runway with the likes of Doutzen Kroes, Adriana Lima and Alessandra Ambrosia. Next we talked about Emma Watson’s feminist speech that went VIRAL. After Jasmine and I watched it we fell even more in love with her (which is impossible because we’re totally obsessed with her as it is)! She’s not only an actress and model for Burberry, she is also a UN Women Goodwill Ambassador. In her 13 minute long speech, she talks about her new movement “HeForShe” which is a movement for gender equality. Jasmine and I have taken many women studies classes in our previous years, and we totally agree with her 100%. We think that she is the perfect person to represent this movement because she isn’t like the rest of the hollywood actresses, she’s actually normal and down to earth. Her being famous allows the message to be conveyed easier as she can use her status of fame to reach out to all her Harry Potter fans and many more around the world. 100 POINTS FOR GRYFFINDOR!!!!! Find the link below to watch her historical UN speech! On September 29ths show, Jasmine and I talked about a lot of important things including Robert Pattinson, Snooki and her baby girl, and the heartbreaking breakup between Amber Rose & Wiz Khalifa. But the most important part of the show revolved around silver fox George Clooney and his new bae. SORRY LADIES! 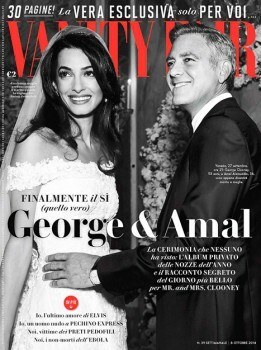 Worlds most eligible bachelor, George Clooney is officially off the market! It’s true, he married Amal Alamuddin, a lebanese lawyer, activist and author (woah… her resume is stacked) on September 27th in beautiful Venice, Italy. But we can’t even stay mad, they make a GORGEOUS couple! Let us know what you think of her custom made Oscar De La Renta wedding dress. We think she looks like a sultry victorian bride! Tweet us at @AllThatJasLive to let Jasmine and I know!